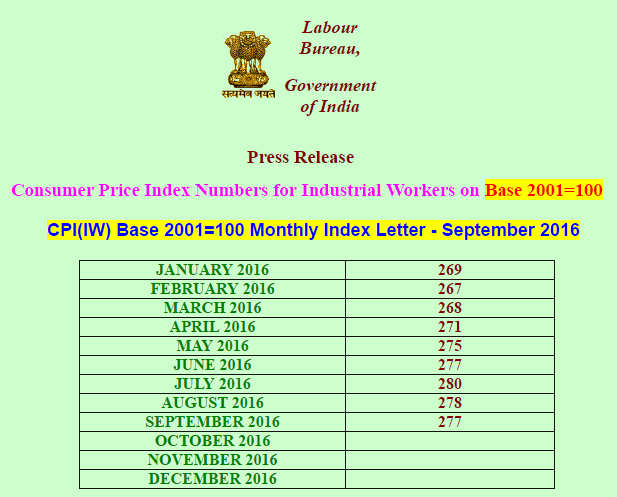 The All-India CPI-IW for September, 2016 decreased by 1 point and stood at 277 (two hundred and seventy seven). On I-month percentage change, it decreased by (-) 0.36 per cent between August and September, 2016 when compared with the increase of(+) 0.76 per cent between the same two months a year ago. Tea (Readymade), Snack Saltish, Private Tuition Fee, Petrol, etc. At centre level, Belgaum, Rajkot, Mumbai and Ahmedabad reported the maximum decrease of 4 points each followed by Ludhiana, Madurai, Agra, Chennai, Warrangal, Bhilwara and Surat (3 points each). Among others, 2 points decrease was observed in 12 centres and 1 point in 18 centres. On the contrary, Angul-Talcher recorded a maximum increase of 7 points followed by Howarah and Amritsar (3 points each). Among others, 2 points increase was observed in 8 centres and 1 point in 7 centres. Rest of the 19 centres indices remained stationary. The indices of 33 centres are above All-India Index and other 41 centres. indices are below national average. The indices of Jabalpur, LucknQw, Pune and Bhopal centres remained at par with All-India Index.